NAL FROM NO. 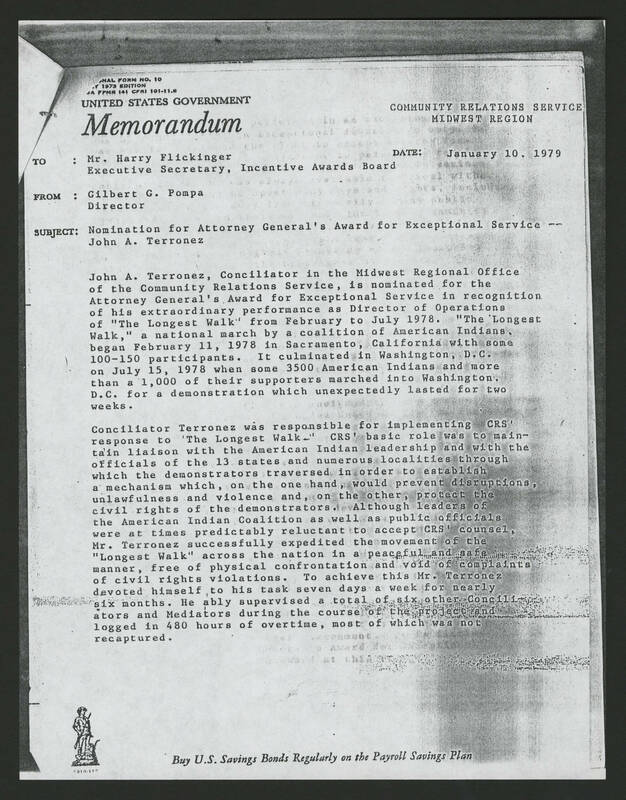 110 1973 EDITION FPMR 141 CPR) 101-11.s UNITED STATES GOVERNMENT Memorandum COMMUNITY RELATIONS SERVICE MIDWEST REGION TO: Mr. Harry Flickinger Executive Secretary, Incentive Awards Board FROM: Gilbert G. Pompa DATE: January, 10, 1970 SUBJECT: Nomination for Attorney General's Award for Exceptional Service - John A. Terronez John A. Terronez, Conciliator in the Midwest Regional Office of the Community Relations Service, is nominated for the Attorney General's Award for Exceptional Service in recognition of his extraordinary performance as Director of Operations of "The Longest Walk" from February to July 1978. in Sacramento, California with some 100-150 participants. It culminated in Washington D.C. on July 15, 1978 when some 3500 American Indiana and more than a 1,000 of their supporters marched into Washington D.C. for a demonstration which unexpectedly lasted for two weeks. Conciliator Terronez was responsible for implementing CRS' response to "The Longest Walk" CRS' basic role was to maintain liaison with the American Indian leadership and with the officials of the 13 states and numerous localities through which the demonstrators traversed in order to establish a mechanism which, on the one hand, would prevent disruptions, unlawfulness and violence and, on the other, protect the civil rights of the demonstrators. Although leaders of the American Indian Coalition as well as public officials were at times predictably reluctant to accept CRS' counsel. Mr. Terronez successfully expedited the movement of the "Longest Walk" across the nation in a peaceful and safe manner, free of physical confrontation and void of complaints of civil rights violations. To achieve this Mr. Terronez devoted himself to his task seven days a week for nearly six months. He ably supervised a total of six other Conciliators and Mediators during the course of the project and logged in 480 hours of overtime, most of which was not recaptured. Buy U.S. Savings Bonds Regularly on the Payroll Savings Plan.